On the evening of 25th April, 1942 at the tender age of 16, I attended a dance at the Avenue Hall (Church Rooms) at Combe Down, Bath. My sister and several of my relations were there also. 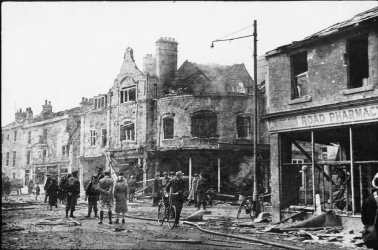 At about 11 30 pm the organiser said the dance must end as an air raid was taking place on the city of Bath. We left the dance hall and hurried to the home of our cousin, Wilcox the Baker, at Combe Road, Combe Down, where we sheltered in the basement until the end of the first raid. Even there, some two miles from the city centre, the noise was terrifying in its intensity. The raid lasted about 1 hour and we stayed with our cousin for another hour or so before my sister and I decided to walk to our home at 18 Upper Bloomfield Road, Odd Down, as quickly as possible as we knew our parents would be worried. We were proceeding along Bradford Road between Fox Hill and Entry Hill when the second raid started. From memory I believe it was close to 3 30 am. There were no houses at Fox Hill at that time, just fields belonging to Springfield Farm, and we had a clear view over the city towards Lansdown. As the raid started the planes came in very low, it seemed almost above our heads and were diving down over the city. In previous months we had watched the raids on Bristol many times from the top of Rush Hill, where we could clearly see the fires and explosions as they were taking place, but this was a new experience for us, very frightening and very close. We watched, spell-bound, for sometime and then as far as I recall, we ran all the way home. Our parents were very relieved to see us. They were sheltering in the smallest room in the house which was a coal cellar between the larder and the living room. Being inside the cellar gave us the protection of two walls either side. We had two near misses; one bomb hit Colborne Road close to the Wansdyke Inn about 100 yards away, and another hit Ballantyne and Rudds Garage in Upper Wellsway, again about a 100 yards away. The only damage to our house was a few cracked windows, the front door being jammed and the back door being blown open. Early the following morning I went with my employer (who had a lorry) into Bath, to see if we could help. The damage was horrific, the civil defence and fire brigade were doing everything they could. There were hosepipes everywhere. My clearest memories are of the devastation at the Bear Flat (pictured; there are other pictures of that area in Rex's story and in the Photographs section), Oldfield Park and Green Park, and the ruins of the churches also stand out in my memory. St James Church was being used as a mortuary, parties of civil defence workers were combing the buildings looking for survivors and we heard of several success stories during the day where people had been pulled from the wreckage of their homes. 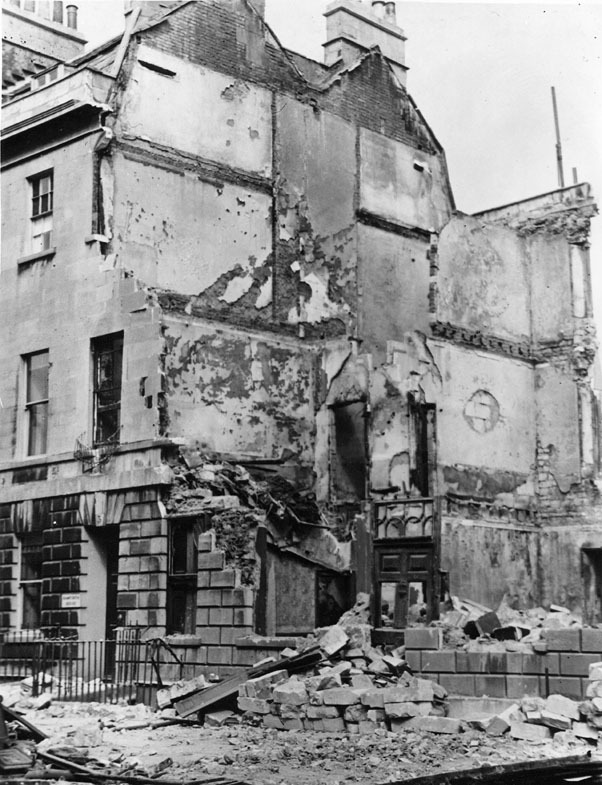 Sad stories kept emerging of tragedies where whole families had been killed, and the loss of life of the Civil Defence workers killed by a direct hit on an air raid shelter opposite the Old Scala Cinema in Oldfield Park. We helped a dentist, Mr Butcher, recover some of his equipment from the basement of his property at Green Park where they were also looking for survivors, and we were then told to clear the area because of the danger of collapsing buildings. Trams had been taken out of service during the 1930s, and the tram tracks had been covered by another layer of road surface. Damage to the road surface would have exposed them again. I can remember old tramlines sticking out from the ground close to the Midland Station at Green Park. The trams had been taken out of service a couple of years previously, if I remember correctly. My memory of things that happened during the rest of the day is vague, but I remember making several trips to the countryside, taking people in my employer's lorry. Here they found refuge wherever they could in case the bombers returned at night time. We were without gas and water, I cannot remember if the electricity was affected. I was at home with my family when the bombers returned after midnight on the night of the 26th. If anything the noise seemed louder than ever. Although we had a Morrison shelter in our living room, which served as a table for the duration of the war, my father thought having the two walls either side of us was the safest place in the house. We spent the duration of the raid (about an hour it seemed) in the coal cellar again. There was a smell of burning. This turned out to be soot that had shaken from the chimney (had we been in the Morrison shelter the soot would have covered us). We were lucky that we only had the clearing of this to tend to in the morning. The next day we again used the lorry to take people to places such as Dunkerton, Combe Hay and Peasedown. Once there they were taken in by the local people, to shelter and rest during following days. Jim Hunt, my employer, at that time had relatives at Trowbridge and we decided to take their offer of shelter during the night of the 27th. We slept on the floor of the Liberal Club in Trowbridge that night and returned home the following day as the bombers had not returned. After all this time what still amazes me is that with all the loss of life and the devastation that surrounded us, how seemingly quickly things returned to normal. Perhaps it's because of the passing of time and the innocence of youth. Frank is not quite right about the time of the second raid. 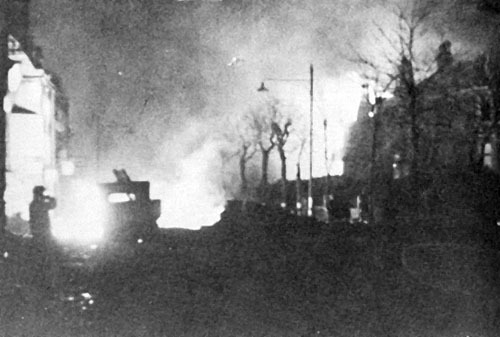 According to the Civil Defence records, the Air Raid Warning sounded at 4:35 am. According to the Civil Defence records, any disruptions to electricity supplies were repaired and power was restored throughout the city by nightfall on the 27th.